Recently, everyone quite often began to hear the phrase "candy bar" and it's absolutely not strange! After all, this is really a fashionable trend of celebrating holidays. And if to speak easier, it is an ordinary sweet table, to which we are already accustomed. But the distinctive feature of candy bar is a certain, chosen and thoughtful style of decoration, elegant sweet "snacks" and flowers that complete the overall composition. Candy bar has become a very popular addition to any children's holiday, birthday, party, engagement, wedding. The main thing is not to confuse the candy bar with the usual sweet table, because its design is, without understatement, the whole art! After all, it is the candy bar that is filled with a huge number of decorative elements, flowers and of course, sweets and desserts. Sweet filling Candy bar: what to submit? • Cake, which is the main accent, in other words the "head" of the table. • Caps, decoration and cream of which, according to the color scheme and style, corresponds to the cake. • Kake-pop - biscuit cakes in the form of a ball, covered with white, milk, black chocolate, caramel or mastic. • Macaroons - a well-known tender almond cookie with a filling inside. • Different shapes of cookies with appropriate decoration. • Fruits in baskets with cream or skewers. • Drinks (lemonade, juice, ice tea, champagne). It is important to remember that when you design a candy bar, you need to adhere to a certain style, everything should be a single, harmonious picture, so it is worth sticking to the chosen color scheme, so that in the end a very bright but elegant composition turns out. In addition to the above listed sweets, just use marmalade, pastille, rahat-lukum, candied fruits, marshmallows, nuts in chocolate. In general, everything that your soul desires! Naturally, the design of a candy bar should be unusual enough not to turn it into an ordinary sweet table. To do this, often use a few simple tricks. 1. Tablecloth. It is necessary to choose an interesting tablecloth that will match the style and theme of your holiday. It can be like a tablecloth of pastel and gentle tones, or something bright. But still it is worth noting that the usual tablecloth is still rarely used. To decorate a table, tulle, large mesh or other textured materials are usually chosen to recreate a certain atmosphere. 2. "Background" or simple words "background" are often decorated too, in order to highlight the sweet zone. Decorate usually with the help of garlands, various light fabrics, ribbons, air or paper balls and, of course, floral compositions. 3. Accessories and decor elements. To make a candy bar really original and add personality to it, you need to use different accessories. For example, beads of different sizes, flags, postcards, candles. But the most delicate and elegant elements of the decor are, naturally, flowers. What colors can I use for Candy bar? For the candy bar, depending on the theme and style, you can use freesias, eustoms, peonies. These flowers add charm, add to the general atmosphere of airiness, extraordinary tenderness, trembling and incredible beauty. 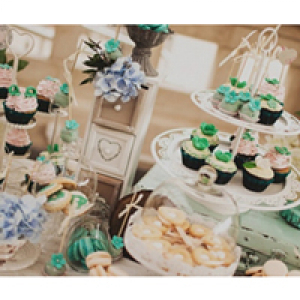 Most often for the candy bar use the pastel colors of the above colors. But if you need to add bright accents, you can choose a completely different, colorful color scheme.